Muscle Growth or Male Enhancement? Ultra Edge XL is a powerful bodybuilder approved muscle building supplement that is rumored to provide sexual enhancement as well. 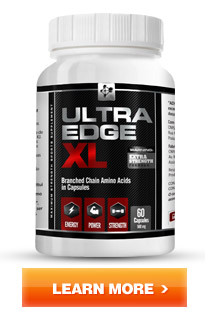 In addition to packing on lean muscle mass quickly, Ultra Edge XL also increases stamina and endurance. In addition to helping bodybuilders and workout junkies extend their exercise routine and squeeze in a few extra reps, this increase in stamina translates to longer lasting sexual experiences. Many users also report experiencing another unintended benefit from taking Ultra Edge XL: erection enhancement. As part of its workout enhancing prowess, Ultra Edge XL increases testosterone levels within the body. Testosterone is an important hormone for protein synthesis, but it also plays a key role in sexual arousal and erectile function. This increase in testosterone levels translates into larger, harder erections as well as more defined muscle development. Branched chain amino acids (BCAAs): Branched chain amino acids are responsible for the increased testosterone levels and erection enhancement. But their main function and reason for inclusion in Ultra Edge XL is the way they promote explosive muscle growth. Amino acids are the main components of muscle and as much as one third of all muscle tissue is made up of BCAAs. These specialized amino acids do more than just create the framework for muscle building; they also stimulate the process by which muscle is created. BCAAs are metabolized directly by the muscle tissue and converted into ATP, a cellular energy source which is responsible for muscle contractions. In addition, BCAAs also increase energy levels and stave off fatigue by prioritizing fat oxidation in glycogen-deprived individuals. This allows for the boost in endurance required to push your body longer and harder and build muscle fast. Vitamin B6: Vitamin B6 plays a key role in amino acid oxidation. It was included in Ultra Edge XL to increase the effectiveness of the branched chain amino acids. While Vitamin B6 does not have any direct correlation with male enhancement, it indirectly contributes to the increase in erection size many users report experiencing. Unlike most other muscle building supplements, it is not necessary to take Ultra Edge XL every day; rather, you only need to take it on the days that you intend to train. Take one capsule 30 minutes before you start training and one capsule 30 minutes after you complete your workout routine. If you are taking Ultra Edge XL as a male enhancement supplement, take 1 capsule twice daily. As male enhancement is a secondary function of Ultra Edge XL, there is no guidance on when to take the capsules. Considering how powerful Ultra Edge XL is many people are quite surprised by how affordable this product is. When compared to the expensive male enhancement products many of you are familiar with, Ultra Edge XL is a much more affordable option. Even when compared to the more inexpensive muscle building supplements most bodybuilders are familiar with, this one easy to take capsule comes out much cheaper than all the protein shakes, nutrient supplements, creatine and other products necessary to achieve substantial muscle gains. Currently, the manufacturer of Ultra Edge XL is offering discounts on larger packages, including a Buy 3, Get 2 Free deal. If you order directly from the manufacturer, your order comes with a 30 day money back guarantee. Men who are looking to increase lean muscle mass and definition will not be disappointed by Ultra Edge XL. Taking Ultra Edge XL helps maximize your workout efforts so you can get ripped fast. If you're a bodybuilder looking to get a competitive edge below the belt as well, we certainly recommend you try it today and see what Ultra Edge XL can do for you.